If you get hooked on a band through their studio albums, you run the risk of being disappointed if they can’t pull off the same magic in concert. Luckily for me, Tumbledown’s Live In Tulsa proves that these guys are no studio creation, as they become even more talented and rowdy in a live setting. Recorded at The Marquee last September, Live In Tulsa perfectly captures four guys playing their brand of down home, country-flavored rockabilly for an enthusiastic crowd of club patrons. I admittedly wasn’t surprised that Tumbledown is an incredible live band since I’ve seen Mike Herrera in concert many times before with MxPx. His band mates, Jack Parker (guitar) and the brotherly rhythm section of Harley (drums) and Marshall Trotland (bass), keep freight train time and help Mike’s songs to stomp, wail and weep. The setlist for Live In Tulsa consists of two songs of their Atlantic City EP, eight songs off their Tumbledown full length, an old MxPx song and three amazing covers. For their original songs, the rumble of “I’m Still Here” and the twang of “State Line” resonate perfectly in the club space and on the album. The MxPx tune, “Rock and Roll Girl,” is a nice nod to Mike’s other band and it translates awesomely to Tumbledown’s hoe down rendition. I’m especially impressed with their cover selections as well. “I’ve Just Seen A Face” by The Beatles already had a country shuffle, but Tumbledown ratchets up the boot stomping tempo to glorious results. Grand Funk Railroad’s “American Band” gets equal treatment, with a fast and fiery cowbell driven version of the classic. In a deft aural example of “knowing your audience,” the guys do a tried and true take of Willie Nelson’s “On The Road Again” that is met with much approval. The album closes with my own personal Tumbledown favorite, “Homeward Bound,” complete with band introductions and solos. I hope these guys can eventually find their way to Nashville so I can witness their power in person. In anticipation, I’m feverishly stocking up on boots to scoot and sorrows to drown. 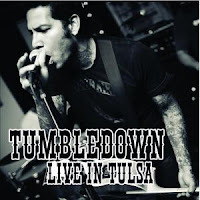 Live In Tulsa can be purchased from Tumbledown's online merch store HERE.